I thought Bleemsync was a really flawed and inaccurate emulator? Bleem! for Windows is, at this point. Sony sued those guys ages ago and so this new program, unrelated otherwise, is named as a nod to that nonsense: Sony now selling a free PS1 emulator for a profit. Using Autobleem (downloaded it a few days ago from github) and I‘m impressed how easy and stable it works so far. Only mystery are mulitiple discs. I haven‘t found reliable infos, can somebidy help me? (Sorry if already talked about). So, how does t work? Using Bin/Cue files. Created to separate folders for Resident Evil 2 Disc 1 and Disc 2. For Chrono Cross as an example, I put both discs in a single folder because the game will ask you to swapthe discs. Am I doing it right? For Bleemsync I see people numbering an .Ini file so that the system can recognize the different files. I‘m asking people here who will definitely know what they are doing and saying before I start to play a game like Chrono Cross and will not be able to swap discs because I made a mistake. It was a long night, will come back here later to see if someone replied. What program do I use to rip my ps1 disks into a playable form for this? IMGBurn is good and most of my rips from that went well. 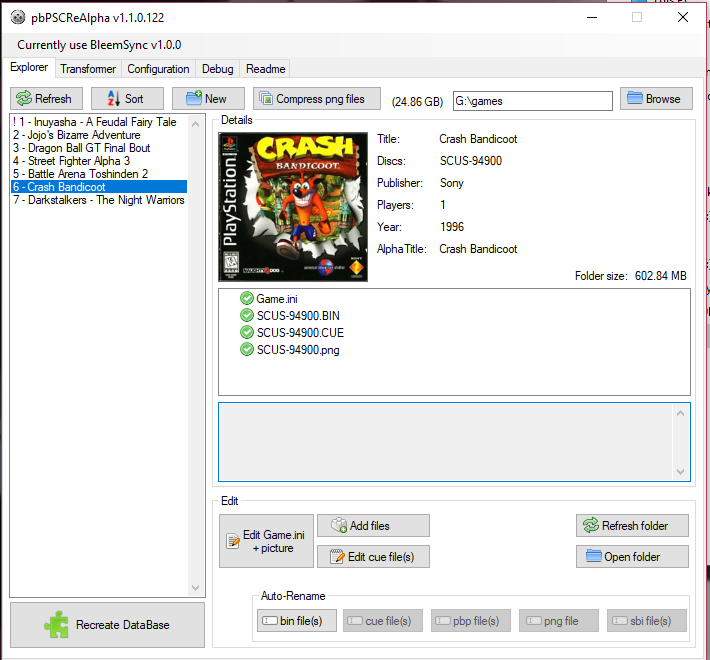 If you have scratched CDs, you might consider PerfectRip, which is kind of a funky little application but it gives you more options for dealing with lost bits and bytes. Curious, are there any good PSOne controller to USB adapters out there that will work on the PSClassic? Hmm. Maybe I should get one for my Digimon World 1&3 games. Always been wanting to rip them. Funnily enough, the Digimon 3 pal verison is superior to the NA one lol, would’ve bought this day 1 if it had that game. Why's the PAL version of 3 superior? In the NA verison, once you beat the final boss, it’s over. Your save just takes you back before you beat him. Plus there’s a fun card game that gets better afterwards with more challenging battles. is there a guide on proper emulation for the ps classic? It's retroarch, same one you use on other devices or PC. It comes with Bleemsync, and as a separate download for Autobleem, both I have linked in the first post. It‘s the best if you search on youtube how to do it. Just search for bleemsync 1.0. it‘s quite easy to do. Once modded you retain all the default installed games, right? I wouldn't want to lose R4 for example. The current mods do not mess with the default games or even software. Autobleem doesn't install anything that I'm aware of, and Bleemsync only installs drivers (for exFAT support) and a small exploit package. Otherwise all of the games are run off of the USB you're using. I gave a few select titles a try, and it's a mixed bag. Beatmania seemed to be fine, and I was able to nail most of the songs with ease. Pop 'n Music and Dance Dance Revolution, though, tended to stutter every now and again, and as a result, made the notes feel off-beat. Whether the stuttering was because of the emulation, or perhaps the USB sticks I'm using, it was enough to throw off my rhythm exponentially, so yeah, it's not ideal. I wasn't even able to get Guitar Freaks to run, as it just hangs at the Playstation boot-up logo. I'm also wondering how Append discs work. I was able to run the original Beatmania key disc just fine, but when attempting to switch Appends by way of the Open button on the PSClassic, nothing happens. Not sure what to label the bin/cue Append files in order for the Classic to detect them, if they even can. Are they 20 bucks yet? Is there a way to play it with a PS4 controller or maybe an xbox one controller? Yes, with a couple caveats. 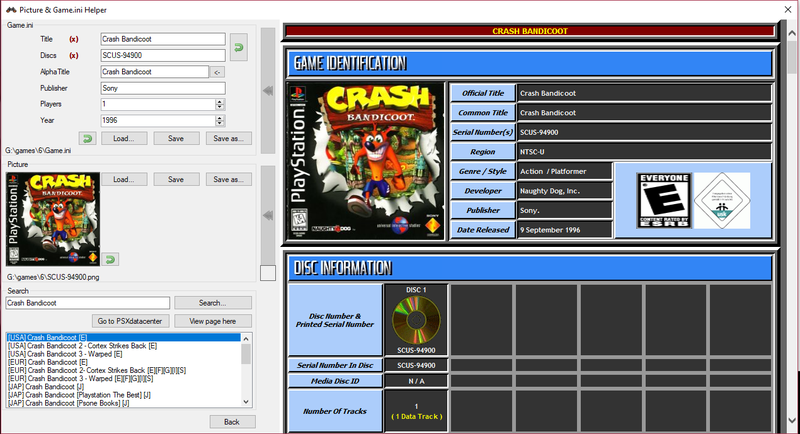 Right now, the system looks specifically for the playstation classic controller to work in the default menu. Also you either need to use a USB cable or buy an 8bitdo adapter since the device has no built in bluetooth. Ordered because of this thread. Thanks, OP! Will look good next to my SNES & NES classics, but even more so since I will actually use this one. If you're using BleemSync you'll put both the base disc and the Append disc as the same game in your menu. It'll be a space waster since you'll have to have the base duplicated across a bunch of Appendices but that's how you'd have to do it to get the Switch Disc/Open feature to work. I'm sure there's some less space-hoggy way of doing it in RetroArch, though. Does this work with the ps4 mini hori controllers? Would it be better to get ps3 dualshock and 10ft usb cables? I bought one from Google express with new app code for $33 shipped+tax. Wouldn't you put all of the append discs with the main game and just keep a note of which disc is which when you switch to it? Oh yes, I forgot you could do that. That makes much more sense, heh. Got this one but the 32 GB version and it's not working, unlucky I guess..? The only way I have been able to do so is if you previously had saved games that already had the gameshark cheats, then move them with MemcardRex to the USB. You can also find some game saves/dex drive saves online. Generally RetroArch has support for cheats and usually you can download them within RA but as the Classic doesn't have internet access, you cannot download them. I also don't know if it's prepackaged for the Classic but you should be able to enter codes manually AFAIR. I guess there's a chance you found a USB3+ version? The amazon listings are really bad, it's almost impossible to tell. I'm sure you've done this, but make sure the drive is formatted and labeled right. - Wait for BleemSync 1.1 and use an OTG adapter on the back port. - Use an externally-powered USB hub in the front port, then stick your USB drive into that. Ah, yep. Forgot about that one! I made sure it was a usb 2.0 listing but it says compatible with usb 2.0/3.0 on the package it came in. I got an old 2gb usb driver that worked and I tried a couple of games. Guess I'll wait for the 1.1 version or have to dig out my old usb hub to use the bigger driver. Hoping someone can help me with something. So I installed bleemsync and it's mostly been great except a few issues. Main one bothering me at the moment is I'm trying to play wwe no mercy on n64 but I can't for the life of me get the n65 stick mapped or work out what I'm doing wrong. For no mercy you need the stick to taunt and do your special yet using my ps4 dualshock it just mimics the dpad. Tried changing the controller mapping but not haf any luck. Just want to map my left stick as the n64 stick. I should have been on 1. Its just a little confusing in the settings with x+, x- etc. All I wanna say do is play no mercy lol. Thanks, just sent you a message. I saw these on sale at Best Buy for 39.99 and remembered seeing this thread. I'd buy one for 39.99 if one of these external emulators can get those games running at full speed. The easiest solution for improving the onboard games is running them through RetroArch, which gives you access to more performance options/tweaks. The ability to shut off the bilinear filter, for instance, among many others. Most games will run decently or as intended on the hardware with the correct options set, from my experience. But I haven’t been playing every genre much less every game, so take it with salt. Does anyone here have this hooked up to a CRT TV? Would something like this work with these cables going from the adapter to my CRT television? You could use something like this if you wanted composite input for your CRT but I feel it would look pretty average, and you wouldn't get better input latency due to the HDMI decoding being done either way. The one you posted is going AV to HDMI, you need HDMI to AV. Hoping someone on ResetEra can help me. Using Windows 7 and followed Mr. Mario's Youtube explanation here verbatim, in the right order, bought the same USB flash drive he uses and I cannot get the Bleemsync UI website to load. I've tried both the http://169.254.215.100:5000 and the BleemsyncUI.com shortcut. I used Google Chrome of course, I'm not a monster. My installation of Bleemsync seemed to be successful, down to getting the Bleem install link and having my PSClassic flash the right colors (though it eventually flashed red the first time I tried to access the UI host, switching ports seemed to do the trick). I saw someone on Reddit recommend waiting for the windows device updates to finish. I did that too (though the last windows update was unsuccessful?). I'm not sure what my options are. I've tried starting from scratch and doing it over but I still got stuck at the same exact point. I also tried following another comment's step by step suggestion of when to plug in the micro USB, when to plug in the USB flash drive, etc. I also tried turning off my firewalls and doing it again. Still nothing. I'll give it a go and report back. Thank you! How is Doom and Final Doom running on it? If i get one it will be for these titles, if it work as good as it was. Looks like the directions (in the Readme within the program) don't really tell you how to add games to your USB. Do you need to create a Game folder on the USB? Do you have a website or video that walks you through it? There are some very, very bare bones instructions in this reddit thread but tons of steps are missing. Thanks in advance. I wish I wasn't struggling so much with this. It's a shame that the BleemSyncUI website doesn't work for so many people. I wish I could figure out what the problem is. 2. Open the program and on the top right click browse. 4. Back to the program, click the "New" button and it should create a folder inside "games" labeled as the number 1. 8. Click "Edit game. ini+picture"
In that Mr.Mario guide video I was instructed to format my USB stick to 32fat or whatever. I then loaded my Bleem files and successfully installed BleemSync onto the PSClassic (at least I saw the install screen). After that, he had you format the USB stick a second time (this time exfat) and then put the Bleem files on the USB stick again. The problem with this is that I could not edit this format of the USB stick with pbPSC. Windows said there was an error with the stick and suggested I "scan and fix it" which I did. Now I don't see a Bleem start up screen when I power up my PSClassic with the USB drive in. Was I supposed to still see that screen? Should I start over and reformat my USB stick and reinstall Bleem? Is there an easy way to use headphones with this? I've googled, but so far no answers. I only formatted it as FAT32, never did it any other format.